It is LOVE WEEK for our Weekly Virtual Book Club for Kids! Valentine's Day might be one of my favorite winter holidays because it is low stress and happy and celebrates love and friendship! As part of our 100 Acts of Kindness Challenge we have been enjoying doing all sorts of acts of kindness this month. In the book The Day it Rained Hearts by Felicia Bond, little Cornelia Augusta catches the hearts that are raining down and uses them to do an act of kindness for her animal friends. Following Cornelia Augusta/s example this week, my daughter and I decided to do an act of kindness for her friends and throw a kindness party! We did simple heart themed activities and made kindness jars! To kick off our celebration we sent out an Evite to all of the girls that we wanted to invite. Then we started planning our activities and buying the supplies. We tried to consider the needs of each guest and take into account their interests as well as any special needs, like allergies. My daughter and I put together our party schedule the night before the party and then we got materials ready and the house decorated! As an act of kindness for her friends, we planned several crafts and activities and a simple service project. Here are the seven activities we did at our Kindness Party last week! We kicked off the party making heart friendship necklaces. This was a simple craft that was open ended and easy for girls to do semi- independently while we were waiting for everyone to arrive. We got the heart friendship necklace idea from Marie at Make & Takes featured at Creative Child. Instead of using foam, we used hard cardboard hearts. They were adorable! Next we hosted a dance party! We decorated one of our rooms with hearts and balloons and the girls got some of their energy out while singing and dancing to some favorite tunes about love. 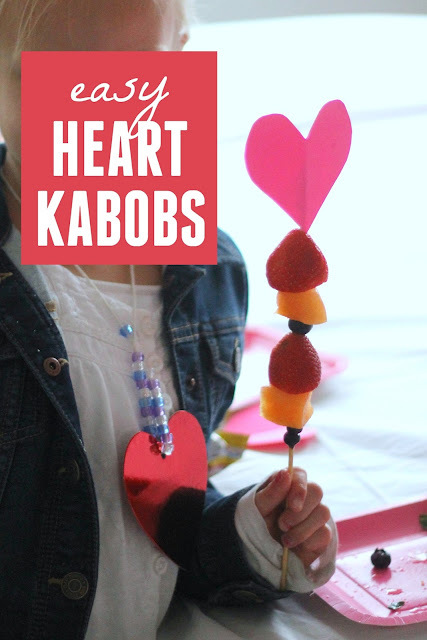 After that we made easy heart fruit kabobs. Originally I planned to have the girls use little heart cookie cutters to cut out their fruit, but I couldn't find my cutters ANYWHERE. To save myself some money and time, we just cubed the fruit and added it to a skewer with a taped paper heart on the end. It looked festive and adorable and sure was yummy! Heart Bingo is always a party favorite. Each girl got a box of conversation hearts and a bingo card and we played a few rounds of Bingo. Bingo is a fun game that is easy enough that you can chat with your friends while you play. We downloaded Valentine's Bingo Cards from Crazy Little Projects. For a heart candy walk you just need a bunch of paper hearts, some painters tape, music, and a bowl of Valentine's Day candy. Tape the hearts onto the floor in a circle and number them. Then start the music! The kids walk around and around in a circle. When the music stops they find a heart to stand on! Then the party coordinator yells a number. If her number is yelled, a child gets to choose a candy. Then the game continues until everyone wins a piece of candy or two! The party coordinator needs to slyly keep tabs on who has not yet won a piece of candy in order to make sure everyone gets one before the game is over. Once a child has won a piece of candy they can either keep playing (in hopes that they'll win another piece of candy), or they can go hang out by the music and have a dance party. Heart Hopscotch is another fun heart themed activity. You can find our full tutorial for heart hopscotch HERE. This is an easy activity to set out that the kids can go play anytime during the party. For our kindness activity at our party, the girls wrote notes to someone they love and then they folded the notes up, stuck them in a jar, and filled the jar with chocolate. At the end we put the lids on and added a ribbon. My daughter was so excited to share her kindness notes and jar with our whole family. 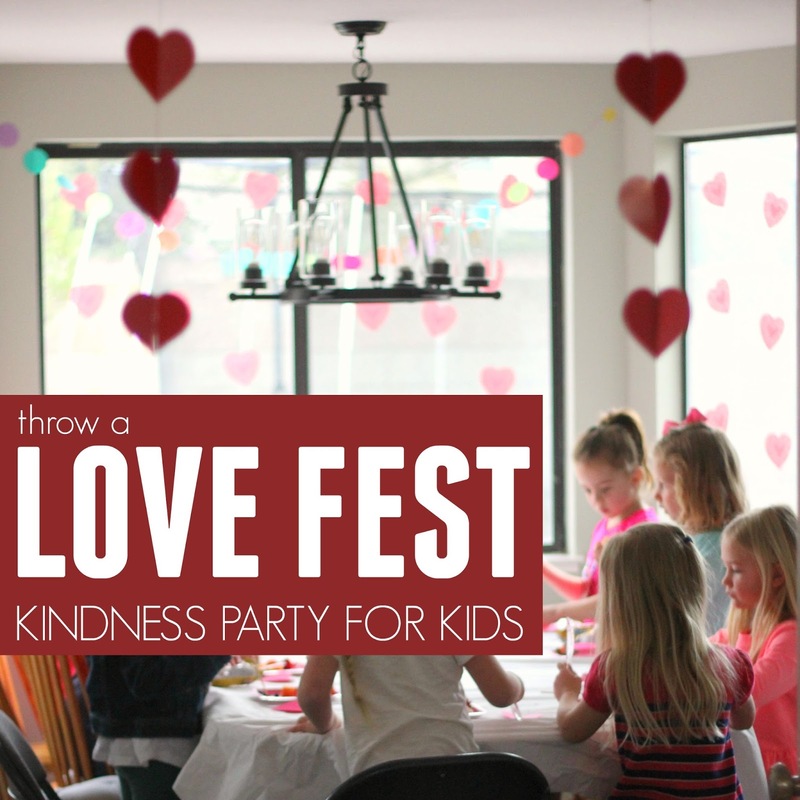 A Kindness Love Fest is such a fun way to celebrate friendship! 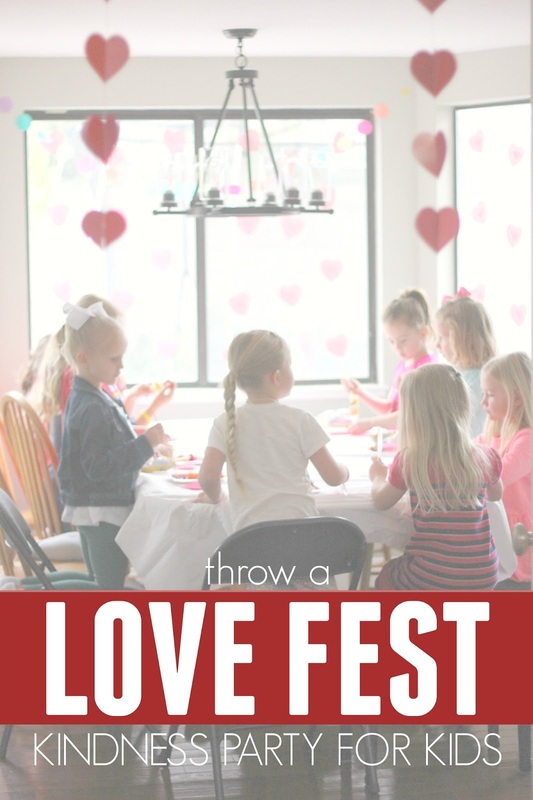 Several of the love themed activities (making necklaces, writing love notes, and assembling kabobs) allowed kids to work on their fine motor skills as well. It is amazing how many skills you can embed into a simple Valentine's Day party! If you have any other favorite love themed activities, please share them!